Ischieto is an old farmhouse of medieval origin -at 800 m from the village of Serre di Rapolano- recently renovated with care and lying 28 km from Siena and 30 km from Montalcino in the wonderful countryside of the area south of Siena. Situated in the hills, only 2 km from a well-known hot springs centre, it is divided into 5 nice little apartments, warm and pleasantly furnished with sat tv. It has furnished outdoor areas, swimming-pool, archery and mountain bikes (2 per apartment, free of charge). The restaurant, in the structure, is open for dinners every day and on request also for lunch. offering typical dishes made by hand.For horse enthusiasts, on request and the owner's time permitting, outings to the nearby woods are organised (stables approx. 6km) very old working farm "Casale Ischieto", renovated, surrounded by fields. 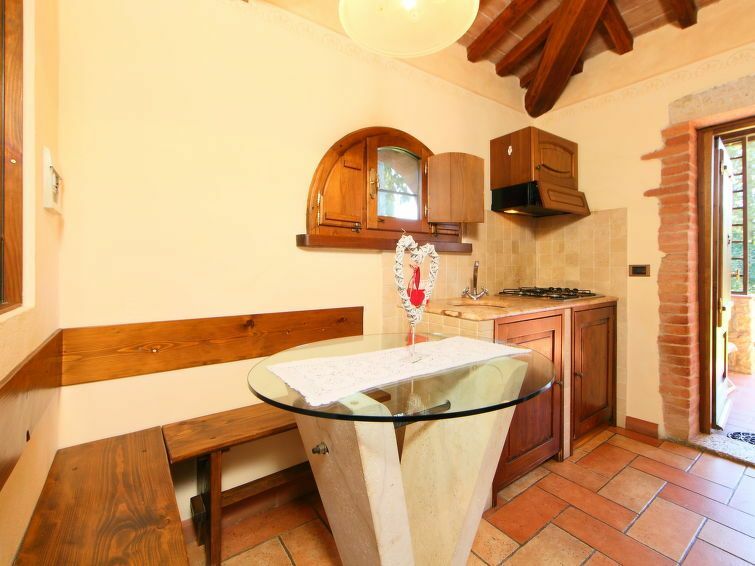 800 m from the centre of Serre di Rapolano, 28 km from the centre of Siena, 30 km from the centre of Montalcino, on top of a hill, in the countryside. For shared use: property 50 ha, swimming pool (16 x 9 m, depth 80 - 165 cm, 15.05.-03.10.) with internal staircase. Outdoor shower, garden furniture. Private: garden furniture. In the house: restaurant, bar, heating to be paid on the spot (01.11.-01.04. ), bicycles available. Motor access to the house. Parking on the premises. Shop 800 m, bus stop 500 m, railway station "Rapolano Terme" 2 km, thermal baths "Rapolano Terme" 2 km. Golf course (9 hole) 21 km, tennis 2 km, riding stable 6 km. Nearby attractions: Castelnuovo Berardenga 18 km, Montepulciano 31 km, Pienza 37 km, San Quirico D'orcia 44 km. Please note: suitable for families, suitable for seniors. There are more similar properties for rent in this same residence. 1-room apartment 30 m2, on the ground floor. Practical and wooden furniture furnishings: 1 double bedroom with satellite TV and air conditioning. Open kitchen (4 hot plates) with dining table, air conditioning. Shower/bidet/WC. Facilities: hair dryer. Internet (WiFi, free). Independent entrance. Furnished veranda. Utmärkt boende. Lugnt och avskilt. Fantastisk vistelse i vackra Toscana! Lugnt, fräscht, trevlig personal.